The pole across the road is lifted, and we are waved through, between a wooden watchtower and a sandbagged machine-gun nest. Not far beyond the tower there’s a billboard with a naive painting pf a Guatemalan soldier in camouflage fatigues. The soldier is shouting, “If I advance, follow me; if I delay, hurry me; if I retreat, kill me!” An inscription below him boasts: ¡AQUI SE FORJAN LOS MEJORES COMBATIENTES DE AMERICA!—HERE ARE FORGED THE BEST FIGHTERS IN AMERICA! I have just begun to wonder whether this is intended for Belizean visitors or rebellious citizens when I see the back of the sign, which direcs its message to those coming from the Guatemalan interior. It shows a gorilla head in the King Kong tradition, or maybe Planet of the Apes. Maniacal eyes burn ferociously, the gaping mouth is dripping with blood and armed with sharp fangs; and lest anyone fail to get the pun … the creature wears a Che Guevara cap. Above it is the single word ¡ATREVETE!—roughly, MAKE MY DAY. Wright goes on to describe kaibil hazing rituals which include cannibalism and drinking human blood. His book, which was originally written in 1989, is (fortunately) now a little dated. Most of the depredations on the Maya population by the Guatemalan army have ceased since a peace that was signed in 1996. 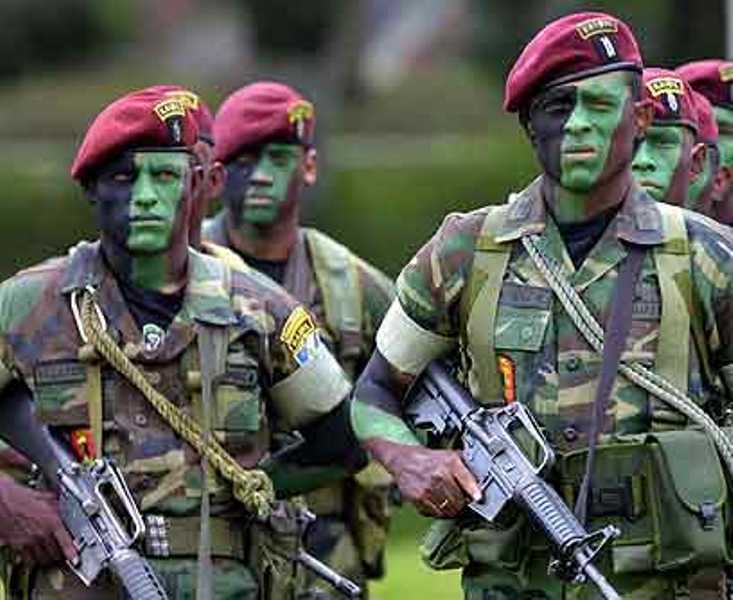 Still, when I go to Guatemala in January, I plan to steer clear of the army. Many of the army posts Wright describes no longer exist. I hope. This entry was posted in travel and tagged army, guatemala, kaibiles. Bookmark the permalink.